Play Claws Vs Paws Slot Online with 500 Free Spins! Claws VS Paws is a 5 reel, 25 payline Online Slot Game by Playson. 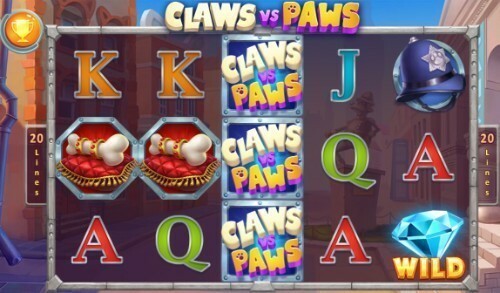 Claws VS Paws has Bonus symbols, Bonus wheel, FreeSpins, Multiplier, Random multiplier, Respins, Scatter symbols, Sticky Wilds, and Wild Features. What comes to the mind when this online slots comes on the screen would most definitely be the cats and dogs bearing the elements of the theme – claws vs paws. Well, the game icon settled any probing thought of what the game might really look like, by giving us an icon of a cat dressed in fluffy yellow with a mischievous smile, while the Lord of the paws, the dog wears sullenness in his blue police outfit. The Cat VS Paws slot game has features such as re-spins, free spins and big wins from the feline characters. There are 5 reels across 20 fixed and active pay-lines. The usual card symbols have the lesser payout values among the more detailed animal based game symbols. The card, 10, when it appears on reels 3, 4, and 5 gives returns of 5x, 10x, and 100x win multiplier respectively. The J, Q, and K provide higher payouts and the A is the most valuable icon in this house of cards with a return of 10x, 40x, and 200x the original stake. The slot game icon with the police helmet will give payouts up 250X the pay-line and, the ‘bone on the cushion’ will yield 40x, 150x, and 300x for 3, 4 and 5 matching symbols respectively. The most valuable slot game symbol is the Claws vs Paws slot logo and if it lands on 5 reels, the payout will be 500X the pay-line. The diamond Wild symbol pays between 2X and 600X the betting line when it comes twice and above on reels. It can replace any icon across the grid to make winning combinations, except for the Scatter. This new online slot game gives a return to player (RTP) value of 96.85%. Playson is a software developer for online slots, based in Malta which has produced games such as Kingdom of the Sun UK Slot and the lovely Alice in Wonderslots online slot. The Lucky Cat Feature: During a spin, it is possible to have a cat device appear on the side of the reels to tweak the symbols. He will supply extra Wild diamonds to make more winning combinations. The cat is also able to push the Scatters to where they can trigger bonus features. Moreover, this luck pusher (cat) can randomly award re-spins between reels 2 and 4. A Doggy Treat: The police dog flashes a red light to the reels at random to re-spin them, thereby shaking out the cards with the lower payout values. Multiple Scatter Feature: Other than the regular Bank Vault Scatter, there is the bank Scatter that appears only on reel 5 to trigger free spin games. The spins keep working until there is no more Wild symbols. Free Games: Landing the cat on a yellow label on reel 5 with the vault in any two positions, will trigger Free Games. The design is cleverly innovative; the game is hinged on a background with a city street, the bank with bone icons, and a cat-like door. There is an accompanying jazz tune to spice up the gameplay. The slot can be played without any hassles on iPhones, Smartphones and tablets, Android and Windows devices, and PCs.